Went so nice! Kind of had a slow runoff but ended good. I am putting this on the record so I can have a digital track of this beer. the end wert that rang in at 1.078 O.G. it is prolly a bit dark for the style...what the heck....it is farmhouse ale. I just had some odds and ends I needed to utilize. what time did you have to get up for that? did you already have all your water measured out? I've brewed starting at 6am before, but on the weekend. a few items the next day while it was still cool outside. A good brew day it was. I'm a midday kinda brewer. I like to brew at about 11am or 12pm on Saturdays or Sundays, usually finish up by about 4 or 5pm. I can't imagine brewing before work, for some reason I'm always super tired after brewing and always just want to take a nap or chill and do nothing for the rest of the day. This weekend I brewed at about 3 and finished up at about 7 or 7:30pm. Only to go out on a bike ride with 2 other friends drinking in parks and staying out until 5am. Man was I tired all day yesterday. Took off the unneeded blow off tube and put on the bubbler. been in front of the swamp cooler at 60 something since I pitched the yeast. Boy it's a good thing I put this info here so I could finish my calculations. I misplaced my recipe printout. 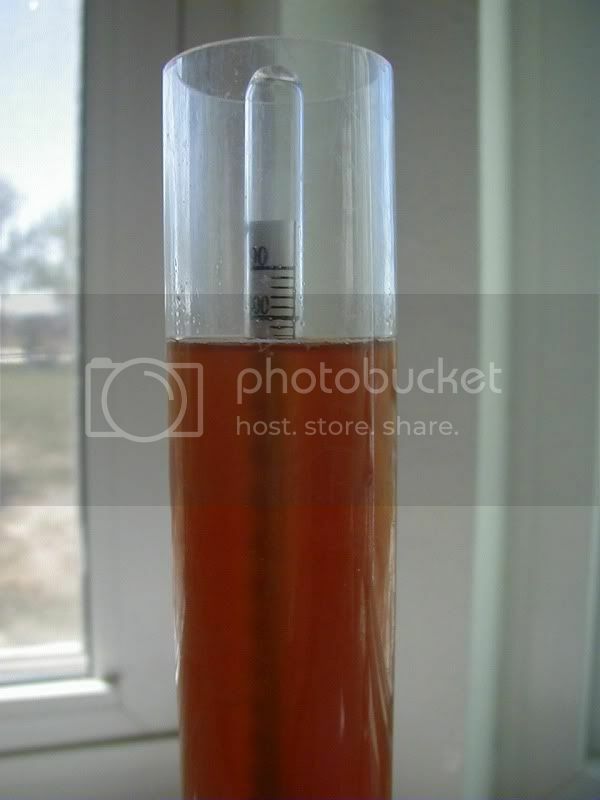 This yeast is really fantastic and a hard working variety! Very dry considering the O.G. this will be a pleasant farmhouse saison. nice and dry! interesting recipe. I'm not familiar with that saison yeast but given your experience with it, I might have to give it a try. This is my 2nd usage of this variety. It truly makes a great Saison.